"Because it's fun to do the impossible!" Since 2005, UpSwing Aerial Dance Company has been a destination for dancers and movement enthusiasts to push their artistic development. Director Cherie Carson brings her unique style, blend of movement, encouraging improvisation and collaboration with her dancers & students. We specialize in merging dance with rope & harness, low flying trapeze (Motivity Trapeze), slings, bungees, and tissu. We have 4 teaching dancers/aerialists on faculty, and 3 adjunct faculty committed to the merging of dance and aerial arts. UpSwing Aerial Dance offers a rare blend of creativity, aerial technique, improvisation, time and space to motivate the artist within you. Our mission is to inspire and share our love of original, aerial dance and that the idea of aerial dance can be extended to reveal human imagination, our relationship to each other and to one's inner self. Creative expression and safety are our two core values in our classes and performances. SUPPORT UPSWING! MAKE YOUR DONATION HERE! 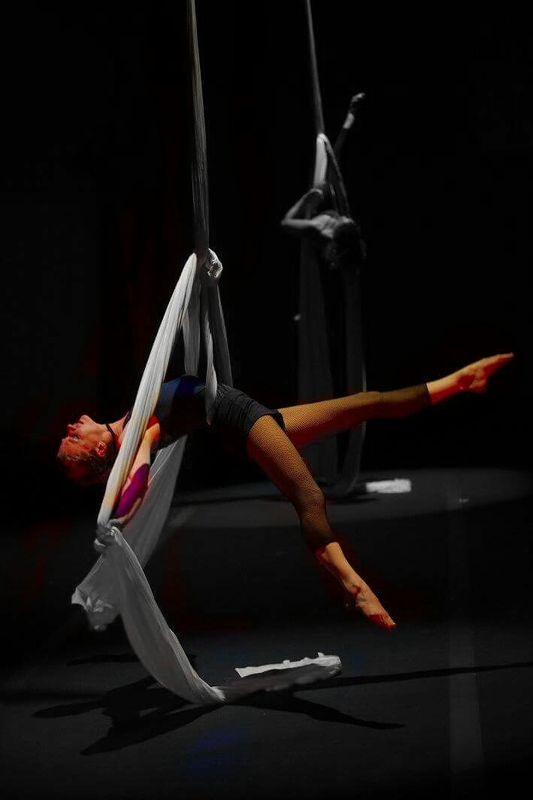 UpSwing is a contemporary aerial dance company that features the repertory of Artistic Director Cherie Carson. The Company has been presented nationally in Atlanta, New York, Seattle & Houston and San Francisco. UpSwing offers opportunities for students to take classes from the Company as well as nationally recognized choreographers and teachers. We also teach workshops across the US including Atlanta, Austin, San Antonio, Houston, Seattle and Santa Barbara. ALL classes, workshops and most performances are held at Studio 12 under the direction of Cherie Carson and UpSwing Aerial Dance Company. UpSwing is a contemporary aerial dance company that features the repertory of Artistic Director Cherie Carson. The Company has been presented locally and nationally, performing & teaching to audiences and students in Atlanta, GA; New York, NY; Seattle, WA; Santa Barbara, Sacramento and San Francisco, CA; and San Antonio, Austin and Houston, TX. Cherie Carson is a contemporary choreographer, dancer, aerialist, teacher, & interdisciplinary artist. Cherie performed her first aerial dance piece in 1990. In 1992, Cherie began to incorporate video into dance. Her video was a finalist for the Robert Bennett Award in LA. In 1998, Cherie performed to sold-out houses at the Edinburgh Festival Fringe in Edinburgh, Scotland. Upon arriving in the Bay Area in 2000, Cherie studied with Terry Sendgraff and in 2005 she took over Terry's Aerial Dance business. She has performed and studied with 30+ national & international dance makers including Molissa Fenley, Merce Cunningham, Bebe Miller, Tanztheater Rubato, Bridgeman-Packer Dance, Douglas Nielson and Dwight Shelton. Upon arriving in the Bay Area in 2000, Cherie studied and taught workshops with Terry Sendgraff. She has choreographed dances that have been performed in a planetarium, on stilts, on roller blades, in sculpture gardens, reflection pools in a dress of 11 yards, on a bungee cord hanging from a Banyan tree, on trapeze, tissu, slings, rope & harness and invented equipment. Cherie has created more than 40 aerial pieces for herself, UpSwing Company & other companies and individual artists. "My life’s work as a dancer/choreographer/artistic director has been to explore my imagination and intuition. While I am not always sure where the sparks of insight come from that drive me to continue to create, to feel passionately about something that doesn't exist yet, to try things to see if they work, to ask questions, this is how I view life and how I view my art form." Kirstin Brown has a BA in Theatre Arts from Humboldt State University. She has worked as a professional makeup artist and currently performs as a belly dancer. Kirstin joined the UpSwing company in 2015 as part of her continuing dance studies: "The next step in my dancing career is to get off the floor, and into the air!." Helen Fitanides danced on the ground for many years, but a whole new world opened up in 2010 when she began dancing with the La Petite Chouette Aerial Dance Company in Santa Barbara. She had the opportunity to learn many aerial genres (including fabrics, rope, trapeze and lyra), and has had the pleasure of performing in California, Arizona, and Colorado. She is thrilled to be dancing with the UpSwing Company! She has a degree in marine biology and works in the environmental field when not flying. Hannah Dworkin is a skilled performing artist and educator with a strong background in modern and aerial dance as well as in opera. The Director of UpSwing Youth Programs, she is a fully credentialed classroom and music teacher. Dworkin holds a B.A. in Dance from the University of California Berkeley and an M.A. in Music and Music Education from Columbia University. A regular performer in musical theatre, she has “flown” in musicals, from Aladdin to Peter Pan. “What I enjoy about performing with UpSwing is that the work unites what I love about the arts – both the visual and dance aspects,” she says. Elizabeth Scotten is a middle school teacher and project based learning expert who integrates the arts with academics. She is a graduate of U.C. Santa Cruz, where she majored in Community Studies, and holds a teaching credential and Masters in Education Leadership from Mills College. Her early training was in gymnastics and ice skating. She began working with Terry Sendgraff in 2000, performing with Cherie Carson, and later with Miranda Company in Santa Cruz. She has been dancing with UpSwing since its inception. “Aerial dance is more meditative and more expressive for me than gymnastics or circus skills,” Scotten says. “The artistry is more of a challenge, and that’s what I love about it.” Elizabeth looks forward to one day introducing her baby daughter, Elliot, to aerial dance. One doesn't choose to be a dancer, they are born one. Helium began dancing from the time she could walk. She had a few formal years of ballet in Atlanta as a young child which she learned key points of alignment and safety that she kept with her the rest of her life. She was introduced to modern in her teens, tried ballet again in college, but chose improv and modern to earn her minor in Dance along the a History degree at Oberlin College. She danced in LA in a modern dance company and for agencies for many years. She thought yoga was her calling and completed a Teacher Training, but it was aerial dance that became the path she had to take when she took her first class in 2009. In 2013 she completed a 10 month aerial professional training at Frequent Flyers in Boulder, Colorado. She moved to the Bay Area in 2014 where she now trains, teaches and performs. When she is not doing aerial, she cross trains with Muay Thai and yoga. Originally from Portland, Cara Zeisloft began dancing at age four, and began taking classes when she was eleven. Cara first danced in the air at The Evergreen State College in 1992, then studied in Seattle with Robert Davidson. She has also danced on the ground with the Chimene Pollard Dance Group, and performed with We Players in site-specific theater on Alcatraz. Cara has a psychotherapy practice in Berkeley. While Cara makes dances of her own, she relishes the chance to turn over the choreography to the ever-inventive Cherie Carson, and just fly. Richard Kittle has worked throughout the Bay Area with aerialists and aerial companies including Bandaloop and Kim Epifano. He has been rigging for UpSwing shows since 2005. Thank you for keeping us on the UpSwing! Assemble Restaurant, Back To Life Wellness Center, Berkeley Moving Arts, David Chee Reverse Mortgage, Buddy Club, Conscious Realty, Chef Pascal, Clif Bar and Co., GoPro, GlassDharma, Monkey Business Camp, Mays Cleaners, Mays Flowers, Namaste Yoga & Wellness Studios, Powell's Sweet Shoppe, Phoenix Aerial Art and Pole, Ruth Stroup Insurance Agency, Sur La Table, Vee Horticulture, Studio 12, Tequila Jorongo, Wente Wines, 8th Street Studio and Sanctuary Bistro. Created in 2017, this is a duet on one rope, using a pulley to balance and counter balance the relationship between the dancers. A nerve once believed to sustain the heart, heart string is a place of connection. A thread that is plucked and pulled, stretches and binds, touched it opens the heart. Created in 2017 for 4 dancers on rope and harness performing on a wall. It is a dance that explores the relationships between stars, the notion that consciousness extends across the universe. Created in 2015 as a 30 minute work on and off the floor. Includes 10 dancers, 2 musicians and 1 vocalist. Sina (Moon Goddess), solo on Lyra. Sina resides within the moon itself, and is the protector of those who might travel at night. She paddled her magical canoe to the moon and was struck by the moon's tranquil beauty and decided to stay. 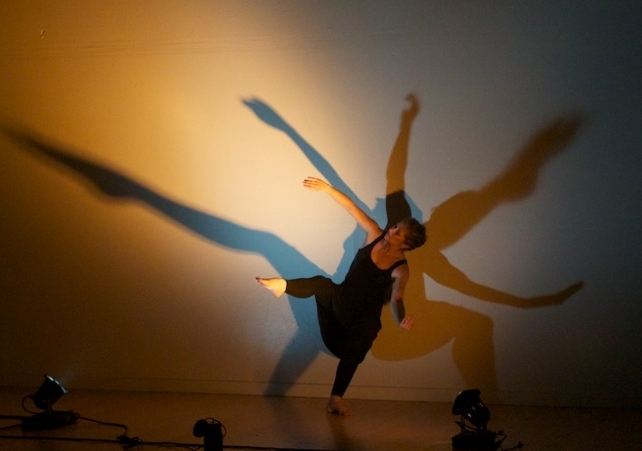 Created in 2011-12, “Chandelier” is a duet piece in which the dancers create a living chandelier. DIVE, FLY, SPIN into this holiday season. Wind your way through the whimsical, mystical and fun aerial showcase created just for you by the Teens Who Fly. UpSwing's teens will be performing their own work, plus the work of Kate Hutchinson and Cherie Carson. They will float into your hearts in this pre-holiday show. UpSwing is a place for fostering a creative lifestyle; a place where students can learn, gain physical and emotional strength and be inventive as they explore their physical limits. This showcase brings together our Teens vision and passion in their own choreography. Join UpSwing and Aerial Dance Marin performers, San Francisco Conservatory musicians and plenty of adoptable pets Saturday, November 3rd for a magical afternoon of awe-inspiring aerial dance, adorable dogs and uplifting music in the redwoods. All donations support local nonprofit Hopalong Animal Rescue in their work to rescue, rehabilitate and rehome animals into loving homes. Tickets are a suggested donation of $25 and up for adults, $10 for youth, and free for 5 and under. No paper tickets will be issued. We will have a list of names at the event. Bring your own lawn chair or blanket for sitting in the park. The Bay Area’s only festival with a focus on aerial artistry, bringing regional, national and international established and emerging artists for three days of action-packed performances, panels and workshops. An explosion of creativity has reinvented aerial performance. A new generation of artists bursting with innovative imagination and extraordinary skills have given birth to one of the most incredible and visceral art forms of the 21st century. Artists from a broad spectrum of backgrounds are re-imagining, re-shaping and re-inventing what has traditionally been the province of circus alone. A breathtaking array of new performers with influences that range from Balanchine to Burning Man are stunning audiences around the world. We aim to bring that explosive energy together in a sensational festival unlike any other. 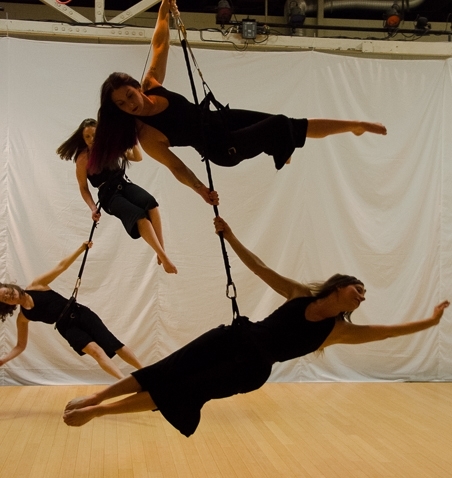 UpSwing Aerial Dance Company & students take flight on May 2 in a one hour FREE studio showing that explores the magic of dancing on the floor and into the air. We will be dancing on the wall, in the air and everywhere in between. Celebrate National Dance Week with the boundary-pushing art of contemporary aerial dance. 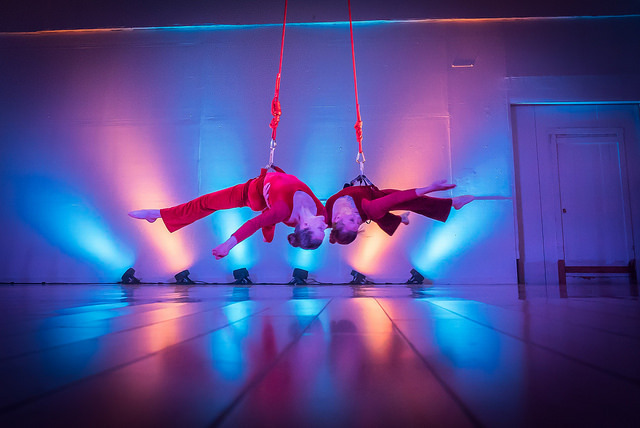 Celebrating Valentines Day with this one of a kind aerial performance pairing the award winning Rainy Day Chocolates with UpSwing's most loved aerial dances. Bay Area premier of "Origin of Happiness" - two dancers explore their relationship with, for and through each other as the discover just how much they are literally attached to each other. This intimate performance includes the pairing of handcrafted, award winning chocolate truffles and treats especially paired to each dance. Your tix includes a box of chocolates to enjoy during the show. UpSwing Company dancers performing in this evening event are Alissa Soto, Helium Valentine, Helen Fitanides, and Kirstin Brown. Join UpSwing from 5–7 PM for the cocktail hour. Enjoy delicious comfort food by Hella Vegan Eats and an outside beer garden featuring craft beer on tap, photo booth, an art exhibition and amazing classic cars along add on the music of Dave Worm and the aerial dance of UpSwing and you have a cocktail hour like no other. This is sure to be a night to expand the senses. UpSwing will host a fundraising raffle of gift certificates from Bay Area vegan restaurants during this 5-7 PM cocktail hour. Dave Worm and Mark Vickness of Glass House will perform music at 5:30 PM. 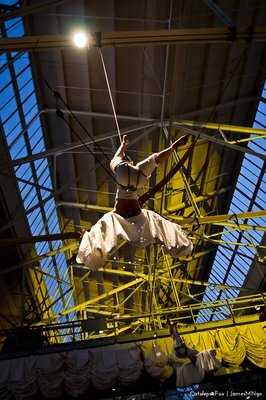 UpSwing’s aerial performance begins at 6 PM. 7th Annual show of UpSwing Aerial Dancers working alongside with OneVoice Circle Singers and Bay Area musicians to create a show in the moment in front of the audience. APRIL 26: OPEN REHEARSAL & RECEPTION AT Studio 12, 2525 Eighth Street, Berkeley, CA 8:30-9:30PM FREE UpSwing Company shares insights and performances of newest work in this intimate studio showing. APRIL 20: 25 POINTS OF VIEW: A PEEK INTO DANCE-MAKING at 605 Addison St, Berkeley, CA An exciting day of dance and creative process featuring 25 local choreographers in celebration of Luna Dance Institute's 25th anniversary, offering a peek into dance-making and the fundamental value of creativity. more details to follow..
NOV 4: COCKTAILS, AERIAL DANCE & KILLER VIEWS Assemble restaurant & UpSwing Aerial Dance Company team up for a magical night, Friday Nov. 4th, 2016 from 4:30-7 PM. Located at 1414 Harbour Way South, Richmond, CA 94804, is a unique setting with beautiful and inclusive views of the entire Bay Area. Upswing will perform newest work in progress and offering an opportunity for you to hear what inspired the dance. Friday Nov 4th, experience the sweeping vistas that extend from the East Bay Hills to the city of San Francisco as we assemble for this one of a kind special benefit for Upswing. The Richmond shipyards take us to the land’s end. Cocktails, small bites, sunset views over the water give a perfect setting for UpSwing’s "Teardrops". 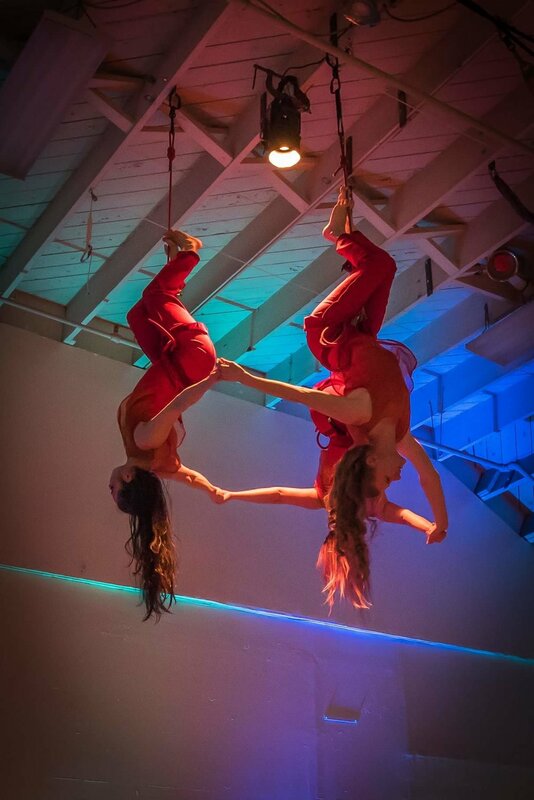 AUGUST 19-21: SAN FRANCISCO AERIAL ARTS FESTIVAL UpSwing Company performs in the San Francisco Aerial Arts Festival, Bay Area’s premiere aerial arts event, featuring internationally recognized aerial artists and exciting new artists breaking into the field. Performance is at Fort Mason Center for Arts and Culture’s Gallery 308 on August 19 and 20, 2016. Produced by Zaccho Dance Theatre, this biennial festival brings together spectacle, daring athleticism and poetry to create a dynamic three day performance event. APRIL 24: FREE PERFORMANCE AS PART OF "DANCE-A-RAMA" 4-5 PM @ STUDIO 12 UpSwing Company and students perform in "Dance-A-Rama" as part of a FREE performance in celebration of Bay Area Celebrates National Dance Week. Choreography by Jennifer "Jem" Alvarado, Kirstin Brown, Ashley Foster and Artistic Director Cherie Carson. Dec 19-21: SOLSTICE! at STUDIO 12, 2525 Eighth Street, Berkeley, CA “Solstice!” is an East Bay favorite holiday alternative since 2005. Produced every other year, this is the 6th production. “Solstice!” celebrates the longest night of the year with music and dance by some of the Bay Area’s finest performers, and includes a Solstice-inspired visual arts installation by Alissa Kaplan-Soto. Enter into a winter wonderland with tree spirits, a moon goddess and snowbirds. Experience the music of Dave Worm and Mark Vickness (Glass House) and Amar Singh Khalsa & Sahib Amar Kaur Khalsa. And see the holiday inspired Teens Who Fly dance their L-O-V-E of the holiday! August 12: IMPROV NIGHT UpSwing Company & students improvise aerial dance to the improvised music of One Voice Circle Singers and musicians Amar and Sahib Amar Khalsa. May 3: DANCE A RAMA UpSwing performs with UpSwing students as part of a FREE performance in celebration of Bay Area Celebrates National Dance Week. DECEMBER 6: WINTER MOON Rockabelly and The Playthings present a winter show, with guest artists Ego Embra, Upswing Aerial Dance Company, and special guest artists. This event combines belly dance, aerial, and pole! August 13: IMPROV NIGHT UpSwing Company & students improvise aerial dance to the improvised music of One Voice Circle Singers and musicians Amar and Sahib Amar Khalsa. July 9: Send-off Cocktail Party for UpSwing Company, wine & cheese, showing of dance and wine raffle. Fundriaser for UpSwing Company performance at Houston Festival of Arts July 18, 19th and workshop on the 20th. April 27: DANCE A RAMA UpSwing performs "Inside the Circle", 8th Street Studios, Berkeley 2-3 PM as part of a FREE performance in celebration of Bay Area Celebrates National Dance Week. April 26: WHAT'S UP! Performing in the show…Kirstin Brown, Helen Dickson, Katherine Sardinha, Beth Zuckerman, Teens Who Fly, UpSwing Company. FREE performance in celebration of Natl. Dance Week. April 29: Dance-A-Rama at Studio 12, Berkeley, CA...Show celebrates National Dance Week Sneak preview of new aerial dance work "Chandeliers"
May 5 & 6: UpSwing guest performers at Diamonds in the Rough, an interactive exhibit of art, innovation and industry, American Steel Gallery, Oakland, CA - performing "Chandeliers"
Dec 2 & 3: NY Aerial Festival, Manhattan Movement Arts Center, NY - performing "Inside the Circle"
Nov 29: NY Aerial Festival, Laguardia Performing Arts Center, NY - performing "Inside the Circle"
"Cherie is one of the best teachers I’ve ever had. She is very observant and always brings humor and kindness into her classes in both yoga and aerial dance. She helps everyone learn at their own level and is very supportive yet pushes people just enough that they grow and learn without becoming discouraged. She also brings a wealth of experience to her classes; this is something I appreciate greatly. I feel her classes have allowed me to learn things I would never have been able to with any other teacher. I highly recommend her!" HUGE thanks to these folks who document dance. Once the performance is done the images live in our minds and through these people and through their lens we relive those moments. Thank you for your photos and video work.